HUNTINGTON, W.Va.… The Huntington District of the U.S. Army Corps of Engineers has named Wesley W. Walker as Chief of the Planning Center of Expertise for Inland Navigation (PCXIN) located Huntington. 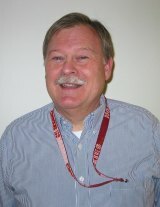 He replaces long-time Corps employee David Weekly who retired January 1. As Chief, Walker is responsible for all aspects of economic studies used in developing the U.S. Army Corps of Engineers’ capital investment plans for the Ohio River System’s navigable waterways. He also has a national responsibility for ensuring that all Corps inland navigation studies adhere to strict peer review requirements. latter a joint U.S. and Canadian effort to identify the best course of action in recapitalizing U.S. and Canadian Seaway locks. A native of Medway, Ohio, Walker graduated from Ohio Wesleyan University with a bachelor’s degree in Economics and History and a master’s degree in Economics from the State University of New York at Binghamton. Throughout his 28-year career with the Corps, Walker has received numerous awards.